This quality apartment is amongst Houses, Villas and other Sort after Apartments that are solely privately owned. The area is surrounded by beautiful trees, lawns, exotic plants, set within excellently maintained landscape and Gardens. The Apartment is situated in front of the Tennis and Glazed Paddle Courts, a fitness center with well equipped apparatus that are enjoyed by a limited select few members and guests. 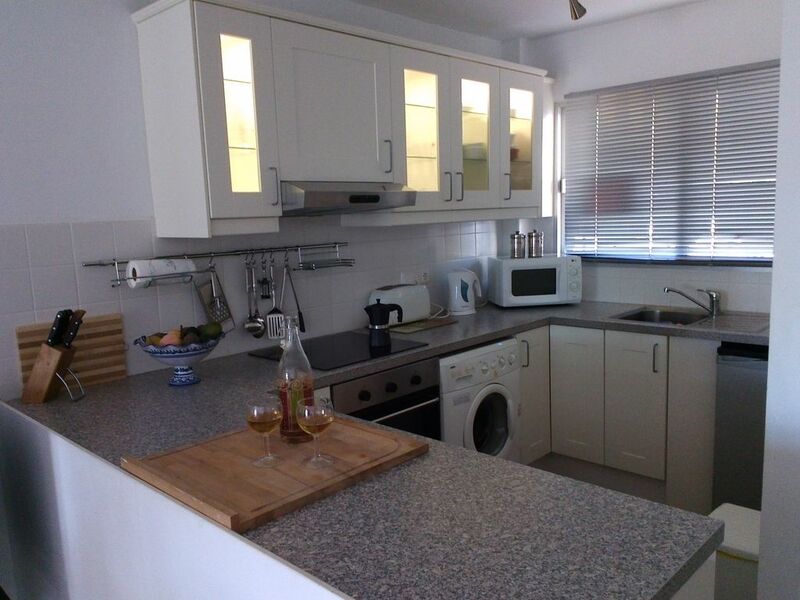 Our apartment is accessed at the rear at ground level whilst providing very peaceful accommodation, there are lovely Spanish, Italian, English Restaurants nearby that serve traditional dishes in a family friendly manner. Only 10 minutes walk away is the horseshoe Bay of La Herradura which is famously known as one of the best beaches in the south of Spain. Only an hours drive from our apartment is the Sierra Nevada, Spain's mainland highest peaks and popular ski resort, at the right time of year, you can, ski in the mornings and sunbathe in the afternoons. Close by to the ski resort in easy reach is the famous Alhambra Palace in Granada, Said to be a modern wonder of the world. Living room has satellite flat TV, Radio and DVD player. Dining room table and chairs that sit six people, ceiling fans, and double sofa bed. All furniture is new, a very modern luxury living area with double patio doors that lead on to a large patio. This very modern kitchen has only recently been built to a very high specification including: Fridge, Washing Machine, Oven and Hob, Toaster, Kettle, Microwave Oven, Ironing facilities, Mini Fridge,Wine cooler all cooking utensils, pots pans and Hoover. Sierra Nevada Ski Resort is 60 minutes by road, from November to April. Organised trips from the village all ski equipment can be hired on the slopes. There are several golf courses all within driving distance Salobrena Los Moriscos 9 holes 20 min drive, La Caleta 18 hole (Baviera Golf) 40 min drive, Anoreto Golf 18 hole is 60mins drive, there are plenty of other golf courses within easy reach towards Marbella/Malaga in 1 direction and Almeria in the other. Notes on accommodation: Our apartment is suitable for children, as there are no main roads and is enclosed in beautiful gardens. For winter stays there is air con h provided. No pets are allowed, smoking may be done on the terrace but not in the apartment. we provide chairs which can be used to take to the pool or down to the beach. There is a freezer box available to take to the beach with sun shades and beach toys. The apartment is truly a home from home with all the amenities you would expect. Outside: The sun terrace has two sun loungers table and chairs for six people the terrace has a sea view. Set in the gardens of los girasoles there is also a fitness gym, for which a small daily or weekly charge is payable. Tennis and paddle courts can be booked with a professional coach at a charge. A short walk away is the pool which is laid to lawn with a large adult pool and a small children's pool and play area. You can play table tennis and bar pool. There is a bar that serves excellent snacks and also a small local run restaurant. Please note we take no responsibly for the opening times of the pool its is owned privately and is totally separate from our apartment. However it is open seasonally from late April to the end of October as a person staying in our apartment you have free entry to the pool and it facilities Cleaning / Towels / Linen / Maid service: Bedding / linen is included with bathroom towels. The property is cleaned before arrival and after departure. At an extra cost we can provide a midweek clean. You must provide your own beach towels. The flat is fantastic has everything you need and has a wonderful balcony that is protected from the wind while still being in the sun so you can always sit int the sun and be warm. If you love tennis there is a club next door with reasonable rates for equipment, and there is a lovely little cafe with great staff as well which is worth a visit for a calm afternoon. There a very helpful folders of information that are great to get you started on your trip with numbers and times of buses and lots more things so you don;t have to randomly explore to find essentials, (but your still can if you like that sort of thing). Access to beautiful community pool with bar and pretty gardens two minutes walk away a real asset. Went most days and it was never busy. Large balcony overlooking paddle courts not overlooked by other apartments. Off road car parking right outside door which is at the back of the apartment block and can be accessed without steps. Comfortably furnished, clean and well equipped for self catering. Communication, key collection, check in and out easy and flexible. Lovely clean 2 bed apartment, with lots of storage space and a spacious balcony. Probably the best equipped apartment we have stayed in, plenty of cutlery, crockery, pots and pans. Thanks to Sue, the owner, for being so amenable with our change of plans. There is a cafe/bar underneath the apartment which is very good. Free tapas with every drink ! And great quality food at a reasonable price. As we were here in January the pool was closed but the racket games were in full flow. The walk down to the bay us about 10 minutes down and 15 mins back up coz it it a bit steep ! Remember to take a torch if you come back up in the dark. All in all a very good week thank you. The apartment was just as described , comfortable and all you could need for a family of 4 . (Children 11 and 15 yrs) .The shared pool and cafe was delightful , very friendly staff and just a 2 minute walk away . We hired a car and found a great beach at punta de la mona , aswell as visiting Aqua tropic water park twice in nearby Almunecar ! A great holiday and wouldn't hesitate to recommend it . Lovely clean and comfortable apartment, which has everything you need. Great pool and bar with relaxed, friendly atmosphere. My teenage boys enjoyed playing padel and we even ventured into the gym - once! Loved La Herradura for its range of inexpensive, good value restaurants and bars. Busy with mostly Spanish tourists, but not heaving. We went to Frigiliana which I highly recommend, a pretty hillside village with a beautiful sunset. Excellent road network making it easy to do a day trip to Granada. My boys also went scuba diving with Angel from Scuba Tropical and thoroughly enjoyed it. Very easy, relaxing holiday. I stayed here with my 3 teenage children, great location and on site facilities. Plenty to do and see within an easy drive. Would highly recommend it. Horse Shoe Bay Beach of La Herradura is only a 10 minute walk from the apartment or a 2 minute drive. Naturist beaches are close by, one being the Playa de Cantarrijan. In La Herradura you have a mile long coast road and a sea front with many places to eat and drink. Late night entertainment can also be found with many bars open until the early hours. There are three small supermarkets in the village, There are many banks and cash dispensers on the beach front. Chemist, doctors, opticians, dentist, and internet cafes are also in the village centre, plus a fabulous fish and flower market. The area is famous for its diving with several diving schools closely located. Paragliding can be viewed from the beach as local enthusiasts display their talents. The Sierra Gordo national park is just minutes away. It is famous for its walks and cycling routes and Mountain Goats and deer The Maria del Este is only 5 minutes drive, where boats can be hired for sailing.